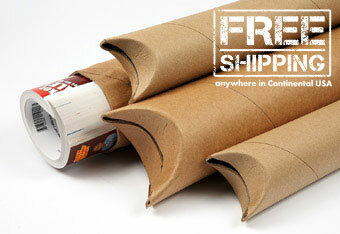 Mail your inexpensive items and posters in these easy to use tubes. Yazoo’s snap-seal or crimped end mailing tubes are ideal for mailing inexpensive or fulfillment items. The easy loading and unloading design creates a cost-effective solution for mailing posters and lightweight products. These tubes are manufactured specifically to eliminate the need for tape and end plugs and are easy to open and close the ends. Our snap-seal tubes are in-stock and available for FREE same-day shipping on orders placed by 4pm EST. Please note: Usable length listed with the ends closed. Custom sizes available from 1-1/2” I.D. to 4” I.D. Custom lengths up to 48” and wall thicknesses up to .125 wall thickness. Contact our sales department for prices on custom sizes or colors.